Houston Aars, 63, calls himself spontaneous. His sister-in-law, Cindy Aars, says it’s more like he’s as stubborn as a mule. 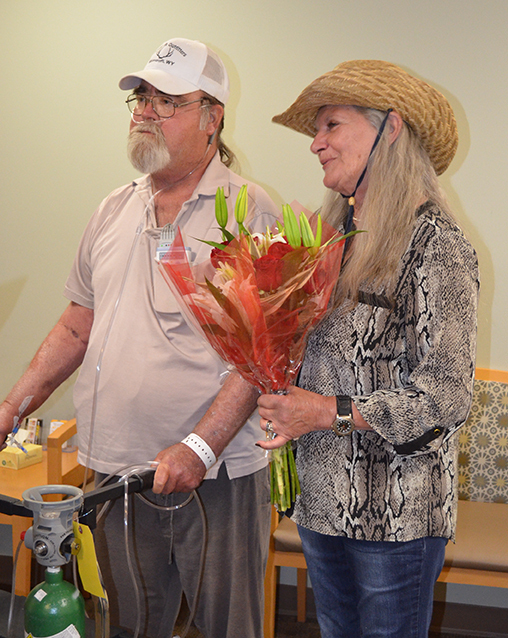 Whatever led to his spur-of-the moment proposal, Aars married is longtime girlfriend Friday in a fifth-floor waiting room at Wyoming Medical Center. Aars suffers from COPD and congestive heart failure. He had open heart surgery in 2000. But, for the last three or four months, he’s felt better than he has in 10 years, and Thursday he was catching up on outside chores at his home near Moorcroft. He just overdid it, he said. They decided to drive to Casper to see his longtime doctor, Dr. Allan Wicks. As they packed, Aars pulled Tomi aside on a whim. Aars says he owes his life and health to three things: The good Lord, Dr. Wicks and Wyoming Medical Center – in that order. He wanted to marry Tomi here because, he said, if it wasn’t the care he received here, he wouldn’t be able to get married at all. “I’ve been there quite a few times and the doctors, the staff, the nurses there have just been wonderful and they’ve actually saved my life a few times. I wouldn’t even be here to do that if it wasn’t for that place,” he said. Houston called a Natrona County judge who agreed to meet them at Wyoming Medical Center on Friday. They picked up a marriage license on their way. Houston’s brother and sister-in-law – Charles and Cindy Aars of Edgerton – served as witnesses. Houston and Tomi have both been married before, and both have children from previous relationships. They met 18 years ago on a construction site. They didn’t even tell their children they were making it official. Friday’s ceremony filled the fifth-floor waiting room. Houston “cordially invited” the floor’s nurses, many of whom he knew from previous hospital stays. A medic who helped put in Houston’s IV came up for it, and the mother of Houston’s hospital roommate came to watch and handed the bride tissues when she started crying. Tomi didn’t know exactly from where the tears came. “After being with him for 18 years, the reality of it,” she said, then paused to find the right words. Houston looked at his new bride -- he in a “Double A Outfitters” ball cap, she in a straw cowboy hat and holding a bouquet of lilies and roses. “I was crying, too,” Houston admitted.